Restoring vehicles can be quite frustration, particularly when you can't find the parts you put in a safe place. Restoration Manager will run on a cheap PC you don't mind leaving in the garage and collect details about the strip down, notes for reassembly and photographs all available when you put it back together. Personal Computer World said "An innovative and indispensable tool for car hobbyists - and it doesn't need an expensive PC to run on". 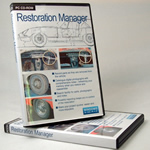 More details and a free, no-obligation trial version are available on the Restoration Manager website. If you or someone close to you suffers from any form of sudden nausea, whether it's motion sickness, altitude sickness, morning sickness, illness or a side effect to a drug, having a sick bag to hand takes away worrying about the mess and smell. We had very car sick children and were frustrated by not being able to buy sick bags in a reasonable quantity for a reasonable price. Chuckie Bags are top quality sick bags available in a handy pack of 10 and in bulk in various quantities up to a box of 1,000. Our bags have a flat bottom so that they don't fall over and a clip on the top to stop the contents leaking out. For more details and to buy online see the Chuckie Bags website.